Huntley held on to defeat Jacobs 34-33 during Jacobs' homecoming game Friday, September 28, 2012 at Jacobs High School in Algonquin. Mike Greene - mgreene@shawmedia.com Kristi Halpin, Payton Berg, and Jaclyn Czech laugh while singing with music being played by a DJ prior to the start of a homecoming pep rally for Jacobs High School Friday, September 28, 2012 in Algonquin. 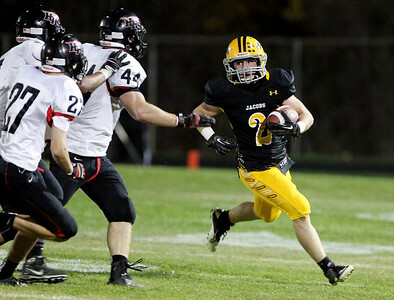 Jacobs lost their homecoming football game to Huntley 34-33. 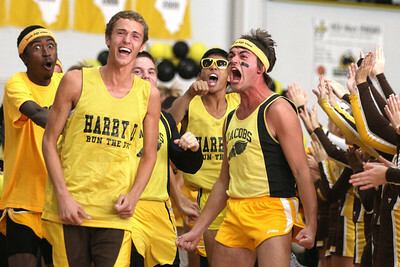 Mike Greene - mgreene@shawmedia.com Cross country members (from left) Julian Lee, Ryan Ross, and Kyle Nelson celebrate while running through a tunnel of cheerleaders during a homecoming pep rally for Jacobs High School Friday, September 28, 2012 in Algonquin. Jacobs lost their homecoming football game to Huntley 34-33. Mike Greene - mgreene@shawmedia.com Varsity cheerleaders (from left) Emilee Sorenson, Kirsten Froehlich, and Morgan Frost hold hands while being introduced during a homecoming pep rally for Jacobs High School Friday, September 28, 2012 in Algonquin. Jacobs lost their homecoming football game to Huntley 34-33. 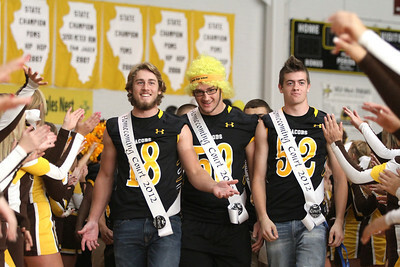 Mike Greene - mgreene@shawmedia.com Connor Conzelman, Adam Kulon, and Nick Starr walk through a cheerleader tunnel during a homecoming pep rally for Jacobs High School Friday, September 28, 2012 in Algonquin. 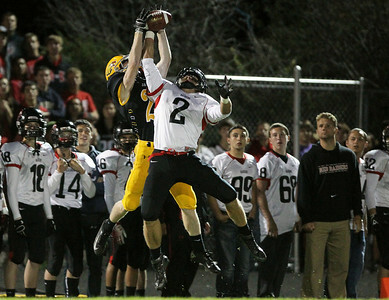 Jacobs lost their homecoming football game to Huntley 34-33. 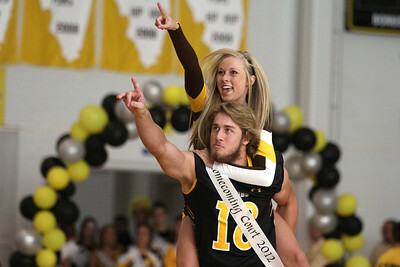 Mike Greene - mgreene@shawmedia.com Connor Conzelman and Emilee Sorenson point to the crowd while being introduced for homecoming court during a homecoming pep rally for Jacobs High School Friday, September 28, 2012 in Algonquin. 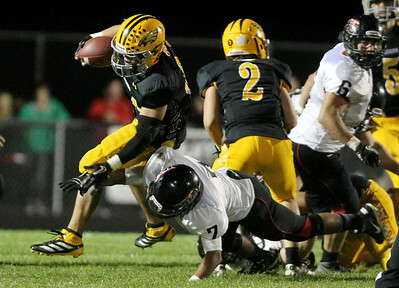 Jacobs lost their homecoming football game to Huntley 34-33. Mike Greene - mgreene@shawmedia.com Huntley defensive back Mike Andrews breaks up a pass intended for Jacobs wide receiver Jake Gierlak during the first quarter of a game Friday, September 28, 2012 at Jacobs High School in Algonquin. Huntley defeated Jacobs 34-33. 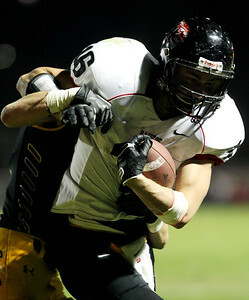 Mike Greene - mgreene@shawmedia.com Huntley wide receiver Jake Lackovic is hit by Jacobs defensive back Nick Gierlak during the first quarter of a game Friday, September 28, 2012 at Jacobs High School in Algonquin. Huntley defeated Jacobs 34-33. Mike Greene - mgreene@shawmedia.com Huntley quarterback Kameron Sallee is pressured by Jacobs defensive lineman Tim Regan during the first quarter of a game Friday, September 28, 2012 at Jacobs High School in Algonquin. Huntley defeated Jacobs 34-33. Mike Greene - mgreene@shawmedia.com Jacobs quarterback Bret Mooney roll out of the pocket during the first quarter of a game against Huntley Friday, September 28, 2012 at Jacobs High School in Algonquin. Huntley defeated Jacobs 34-33. Mike Greene - mgreene@shawmedia.com Jacobs running back Greg Sidor is swarmed by a group of Huntley defenders while running during the first quarter of a game Friday, September 28, 2012 at Jacobs High School in Algonquin. Huntley defeated Jacobs 34-33. Mike Greene - mgreene@shawmedia.com Huntley wide receiver Jake Lackovic reels in a 78-yard pass for a touchdown while being defended by Jacobs Nick Gierlak during the first quarter of a game Friday, September 28, 2012 at Jacobs High School in Algonquin. Huntley defeated Jacobs 34-33. Mike Greene - mgreene@shawmedia.com Jacobs running back Josh Walker looks down field for defenders while rushing during the first quarter of a game against Huntley Friday, September 28, 2012 at Jacobs High School in Algonquin. Huntley defeated Jacobs 34-33. Mike Greene - mgreene@shawmedia.com Jacobs running back Steven Varela is upended by Huntley defensive back Damario Hughes during a rush in the second quarter of a game Friday, September 28, 2012 at Jacobs High School in Algonquin. Huntley defeated Jacobs 34-33. 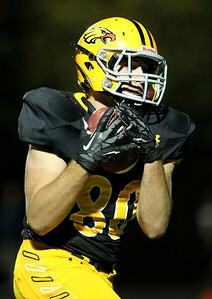 Mike Greene - mgreene@shawmedia.com Jacobs tight end Jake Dziewulski reels in a 35-yard pass for a touchdown during the third quarter of a game against Huntley Friday, September 28, 2012 at Jacobs High School in Algonquin. Huntley defeated Jacobs 34-33. 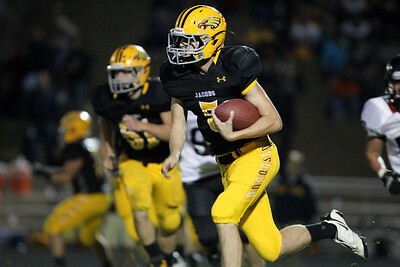 Mike Greene - mgreene@shawmedia.com Jacobs quarterback Bret Mooney rushes during the third quarter of a game against Huntley Friday, September 28, 2012 at Jacobs High School in Algonquin. Huntley defeated Jacobs 34-33. Mike Greene - mgreene@shawmedia.com Huntley quarterback Kameron Sallee releases a pass while under pressure during the third quarter of a game against Jacobs Friday, September 28, 2012 at Jacobs High School in Algonquin. Huntley defeated Jacobs 34-33. Mike Greene - mgreene@shawmedia.com Jacobs running back Steven Varela pushes off of Huntler defensive back Damario Hughe during the third quarter of a game Friday, September 28, 2012 at Jacobs High School in Algonquin. Huntley defeated Jacobs 34-33. Mike Greene - mgreene@shawmedia.com Huntley wide receiver Bryce Beschorner holds onto a pass while being defended during the fourth quarter of a game against Jacobs Friday, September 28, 2012 at Jacobs High School in Algonquin. Huntley defeated Jacobs 34-33. Varsity cheerleaders (from left) Emilee Sorenson, Kirsten Froehlich, and Morgan Frost hold hands while being introduced during a homecoming pep rally for Jacobs High School Friday, September 28, 2012 in Algonquin. 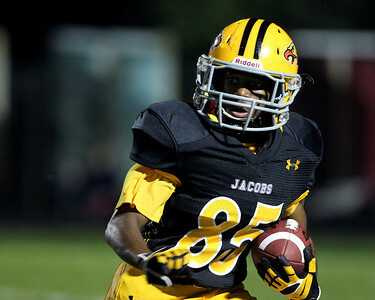 Jacobs lost their homecoming football game to Huntley 34-33.